Earlier this year I wrote a post about all the gorgeous sets used in the Jane Fonda-Jennifer Lopez comedy Monster-in-Law. 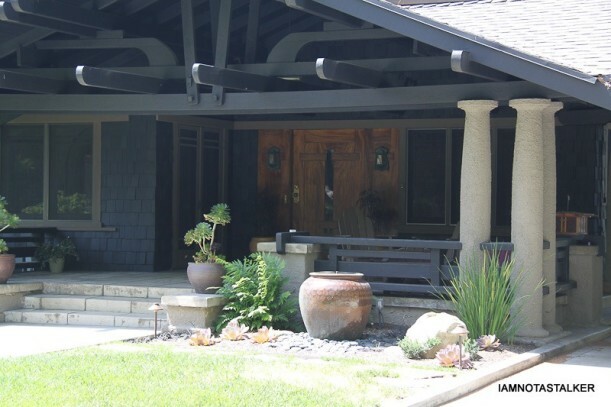 My personal favorite was this Craftsman that Kevin (Michael Vartan) lived in. 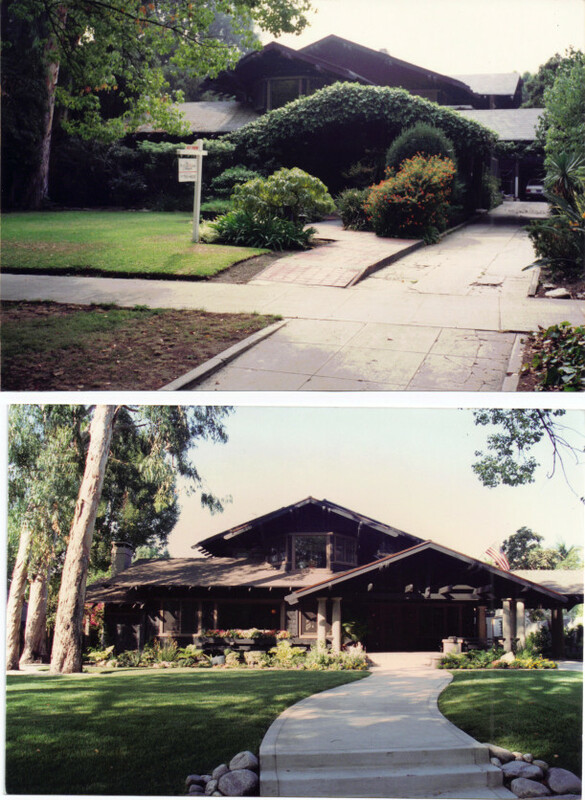 Lindsay of Iamnotastalker, who is the Nancy Drew of movie houses, found the actual house that they used in Pasadena. She reported that it’s known as the Ross House and was built in 1911 for $8,000. 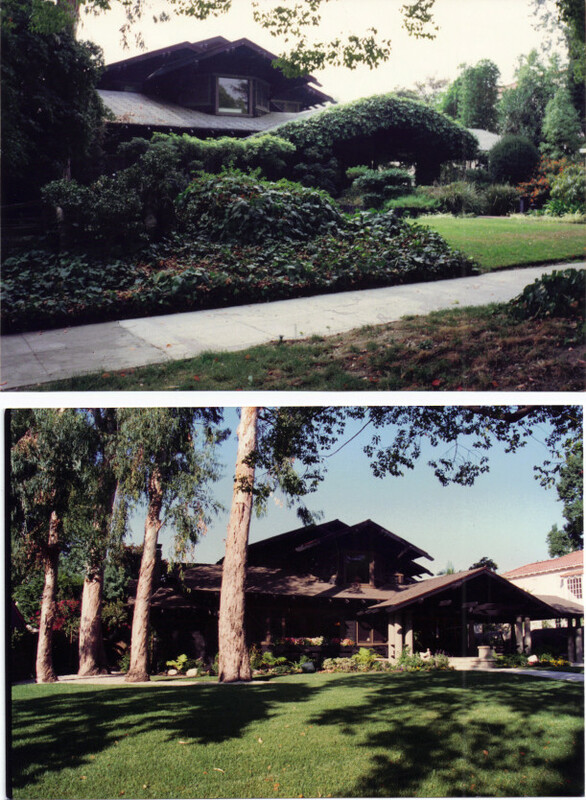 The house features Craftsman, Asian, and Neo-Classical design elements and is on the National Register of Historic Places. The movie interiors were all built on a soundstage, and we never got to see inside the actual house. 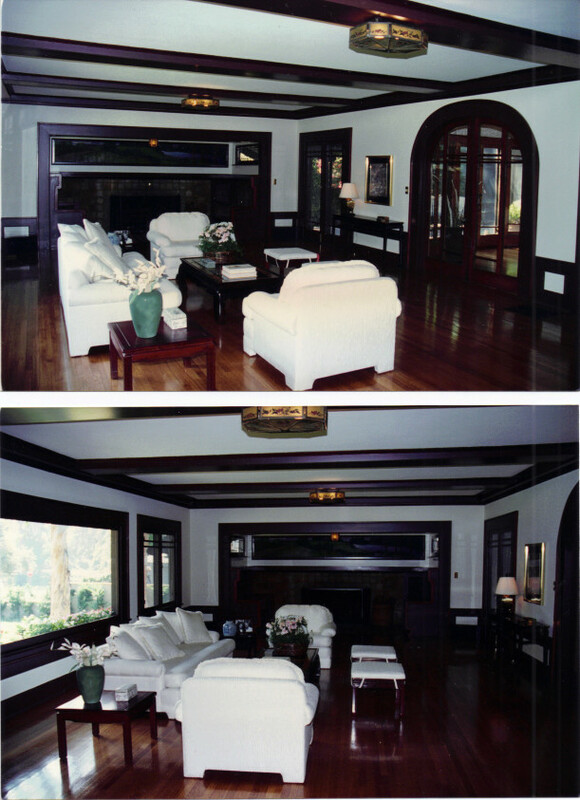 So I was thrilled when the owner of the house sent me some personal photos of his home. The house features Batchelder tile, 4 bedrooms, 3 baths, and over 4,600 square feet of living space. I can’t thank Frank enough for giving us a peek inside his beautiful historic home. To see how they recreated the interiors for the movie, check out my original post about Monster-in-Law. I have a soft spot for Craftsmans – beautiful home! Thanks for sharing! .-= Jess @ Frugal with a Flourish´s last blog ..Bright Blue Redo =-. That house is stunning. Thankfully it fell into the hands of someone who appreciates it. .-= Laura´s last blog ..Run for the hills =-. loved that movie. what a great home. looks so much better after! .-= Becky @ Farmgirl Paints´s last blog ..Garden guilt =-. What a great house! Such detail and built to perfection. I love how removing all the over grown greenery allows you to see the beauty of the architecture, all the over-growth really hid the beauty. Thank you for the english lesson, I loved clicking on highlighted words and learning what they represented! .-= Pat´s last blog ..Labor Day 2010 =-. That is so cool that he sent you photos!! I love love love Craftsmans. This was a neat peek! Wow. Can you imagine fixing up an historic home and finding treasures such as those? How rewarding that must have been! .-= Richella at Imparting Grace´s last blog ..Todays the day =-. That really is a treasure of a home- Frank has done an amazing job of restoring. Gorgeous! .-= Bettsi´s last blog ..Something Lovely =-. This looks like the same house used in, Zathura, but I’m not sure. I don’t readily have the movie but I remember loving the interior! .-= Bethany´s last blog ..Drove her mad! =-. What an amazing home! Wow. .-= jennifer black´s last blog ..One Step Forward you know the rest =-. A great home and easter eggs too! At least the former owners didn’t do too much harm with the ’60s paneling. .-= Why S?´s last blog ..What is Labor Anymore =-. Wow!! It looks as if the house was trying to escape from the jungle. So glad the current owner could save it. 😉 How cool is it that people are willing to send you photos??! Awesome! .-= Amanda @ Serenity Now´s last blog ..A Real Labor Day =-. .-= Lori-Anne´s last blog ..A Picture’s Worth a Thousand Words =-. .-= Juju at Tales of Whimsy.com´s last blog ..Book Beginnings Friday- Sketching =-. What a wonderful house! I love that Frank restored it instead of modernizing the house to today’s style. This home has been beautifully and lovingly restored and it shows. Thanks so much to Frank from the up close and personal views. Proud he must be! Really fascinating post. I love that the owner sent you photos. And it’s wonderful to see the transformation in the front. I love the Craftsman style! .-= Lesley @ The Design File´s last blog ..Idea 6- Transform a piece of furniture =-. I love this house! Such drastic and amazing before and after shots. The difference that landscaping makes is staggering! 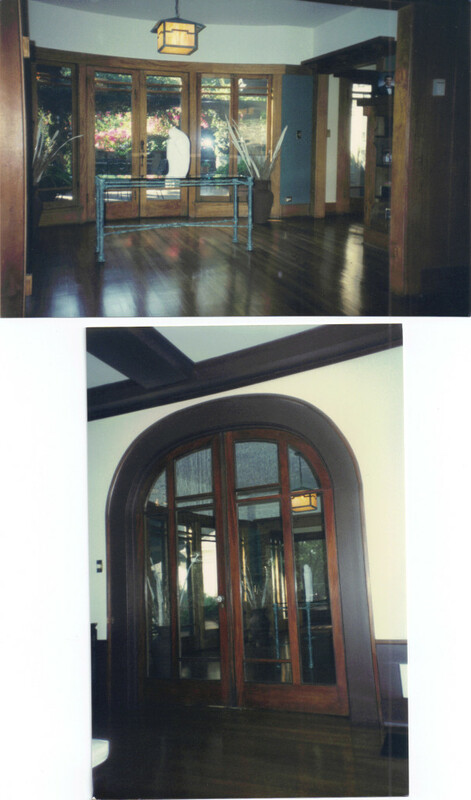 I love arched doors and the dark glossy wood is just gorgeous. Great post! .-= Bre´s last blog ..Clean House =-. What beautiful woodwork! I may not remember the movie, but I def remember that house! .-= Melanie @ The Tiny Tudor´s last blog ..The Powder Room or Crazy Purple &amp Black Bathroom =-. I really like the double doors-now that I live in an older home, I LOVE the old woodwork. A home can look modern, but have a feel of charm from the old woodwork too! .-= Josanne´s last blog ..A New and Simple Chocolate Bouquet! =-. So sad they don’t make them like this anymore. It makes the careful restoration done here even more special. I watched A Single Man last weekend…his house would make a good post…also Julianne Moore’s Ikat headboard was divine! Hi Julia, I remember that house from the film — it was terrific. The other one I love is in the TV show numbers. Those homes are American treasures. Did you hear about our $100 value Roxy girls’ bedding giveaway? Hope so (it ends tomorrow). Jane F.
.-= Jane F @ Atticmag´s last blog ..Diva Closets =-. me and my man, we live in france, and comme from holland. do you can help me to find the plan of this home?? ?